Fishing has never been an easy activity that is why it gives you a feeling of fulfillment each time you have a great catch. Fish finders have become amongst the tools that fishers of different skill levels would want to carry with them. As such, you can already find a lot of different models and brands; in fact, there are already those that have modern functionalities, and one of which is the Deeper Smart Sonar PRO+. The only item you will need to complement the Deeper Smart Sonar PRO+ is a smartphone or tablet, and who of us does not have a smartphone these days? By using a WiFi connection, imaging is communicated directly to your gadget. So many anglers these days enjoy taking half a day in the kayak and the other half on the bank, and the Deeper can simply be placed on a line and cast out into the water from your kayak or the bank. What more can this fish finder offer? Let’s find out together. The Deeper Smart Sonar PRO+ is designed to help you improve the four stages of fishing which are casting, scanning, targeting, and catching. It is the latest upgraded version of the company’s smart series. WiFi Connectivity: With this device, you no longer have to worry about searching for a fishing location with a WiFi connection since it has an internal WiFi access point that will communicate with your mobile device. Its Wi-Fi connectivity has a 330 ft range that allows for iOS and Android compatibility with zero need for internet or cellular data. Mapping Technology: Its Real-time Bathymetric mapping quickly displays terrain information to your smartphone. It also has a built-in GPS receiver that provides accurate mapping information that can also be used for its tracking data. Design: Having a weight of 3.5 ounces and an orb design, the unit can be cast from most rods which create a new hassle-free method of sonar deployment. It has a diameter of 2.5 inches and a user-friendly design that is why all of the information is clearly depicted on the user’s smartphone. Battery: The unit is equipped with a rechargeable battery that is designed to last for about 5.5 hours of continuous operation when fully charged. Adjustable Settings: Its fully adjustable sensitivity allows the user to gain a better idea of the environment below them and have a clear picture of depth, fish arches, terrain contouring, etc. The captured fishes are also clearly marked with a fish icon alongside their respective depth and size. You can also choose to remove or add the fish icon, turn the alarm on or off, and choose a different color display. The Deeper Smart Sonar Pro+ is an innovative fish finder that offers functionality alongside versatility. The seasonal practicality of this device allows users to effectively track fish whether ice fishing during winter, trolling the device behind them during spring, or casting into a lake over summer. This is thanks to its buoyant orbed design that makes the device very lightweight. Being able to pair this fish finder to your smartphone is also a huge plus as the app is extremely user-friendly. The Deeper app is available on both iOS and Android and can be viewed on laptops through the use of Lakebook. Deeper cloud also provides the user the ability to free up space on their device by storing everything on their online database. Using Wi-Fi, as opposed to Bluetooth, like most other fish-finding devices allows for a drastically increased range as the Deeper Smart Sonar Pro+ achieves an effective and stable connection up to 330 ft. It also has a battery life that will see most of us through our daily fishing trips but bear in mind that since it is synced to your phone or tablet, the battery of your gadget should also match the fish finder’s battery life. For those looking for a fish finder with similar functionality but are almost a bit more budget conscious, the Vexilar SonarPhone T-Pod could be right for you. Users still benefit from smartphone connectivity using Wi-Fi over Bluetooth networking for increased range, but due to the design and construction of the T-Pod, it’ll track perfectly straight up to five miles per hour when being trolled behind your kayak or boat. The T-Pod is water activated, so it automatically turns itself on and off to conserve power. This fish finder also utilizes a single, 30-degree wide signal beam and uses a 125 kHz frequency transmitter. The T-Pod also comes with a free neoprene armband, allowing quick and easy access to your smartphone while on your fishing trip. On the other hand, if you like the functionality of the Deeper Smart Sonar Pro+ but fancy trying something new, then the Lowrance Fishhunter Pro might be a great choice. Users will again benefit from not needing a data connection in order to connect to the device as well as using Wi-Fi connectivity over Bluetooth for greater range. This unit also links to your smartphone or smart device to produce clear and easy-to-read feedback. When a fish is detected, fish symbols also appear for quick and easy recognition. Users are also able to create custom bathymetric contour color charts of their favorite fishing spots by simply trolling the device behind them as a paddle or drive through the area. The Fishhunter Pro uses a tri-frequency transducer which supports 381 kHz, 475 kHz, and 675 kHz frequencies. 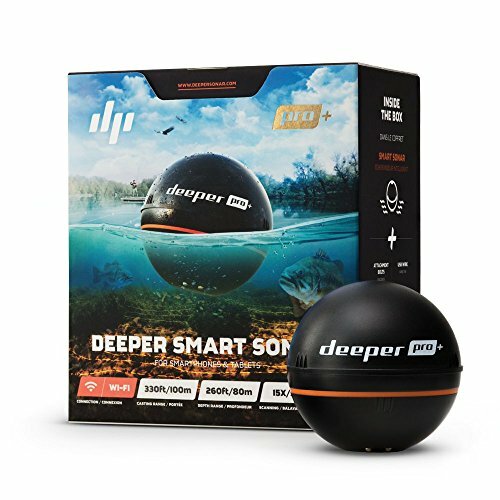 The Deeper Smart Sonar Pro+ is a great option for those fishing in a variety of different terrains and weather conditions. It’s extremely adaptable, easy to use, portable, and delivers all of the necessary functionality most of us recreational fishing enthusiasts are after. Those of us who take extremely long fishing trips might suffer a little bit with the battery life, but for the most part, it’s never really an issue. Being so lightweight, it can be cast from the vast majority of rods and by anglers of all ages, making it a great choice for anyone looking to increase the effectiveness of their fishing trips without breaking the bank.